I recently traveled to Switzerland to see the world’s first autonomous shuttle in operation on regular fixed-route public transportation in mixed traffic. 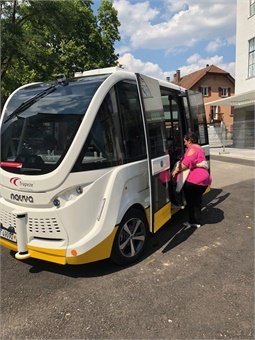 As CNN reported, the town of Neuhausen Rheinfall, Switzerland started operating a Navya autonomous shuttle in March 2018 on their regular service route. I came home with three lessons learned from the land of Swiss clocks, chocolate, and the Alps. I spent time in the Operations Control Center for the Zurich Transit System. This system transports over one million passengers a day on 500 buses, trains, and trams. This is more than twice as many passengers transported on about half the number of vehicles as I oversaw at the MTA in Baltimore, and they control it all with only four controllers/dispatchers at peak periods. They have detailed plans laid out for any possible disruptions that come up during normal operation of their transit system. All four controllers work in concert from previously planned scripts that include communications to drivers, road supervisors, law enforcement, emergency services, public announcement, and the media. It’s all done electronically with little verbal communication necessary through powerful CAD/AVL (computer aided dispatch/automated vehicle location) software. They also have several full-time operation planners who work proactively to set up these plans and scripts and then evaluate post event responses. So, fully utilizing the capacities of high end CAD/AVL software technology can enable fewer controllers to handle more work. Using Intelligent Decision Support (IDS) with pre-defined scripts can assist in more quickly and efficiently handling service disruptions. We can do more with less by allowing technology to transform transit behind the scenes. 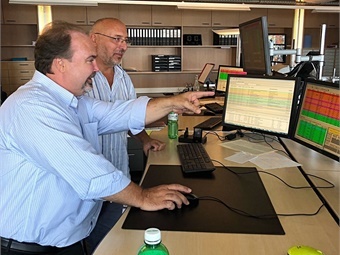 Paul Comfort (left) receiving an overview of the technology at the Zurich Transit System’s (VBZ) Operations Control Center from one of their managers. Most places trying driverless (autonomous) shuttle buses here in North America are using them as pilots for tourists (i.e. Las Vegas), on closed corporate campuses, or on divided guideways/roads. But in Neuhausen, Switzerland (a town in the state of Schaffhausen), the local transit authority is operating the Navya 11-passenger autonomous bus on a regular fixed route, integrated into their public transit bus/tram system. The service provides for transfers at certain stops between the autonomous shuttle and full size buses, but can also be taken on its own, with free boarding, on a 10 minute loop through multiple blocks in the town. I rode it myself numerous times and watched it in action from several vantage points along the route. I spoke with passengers and the attendant/steward who rides the bus (and has a video game type controller to use if/when necessary). The shuttle bus operates fairly smoothly and stops when pedestrians, bikes, or other cars move in front of it, which it did while I was riding. It is a tourist attraction in itself with nearly 10,000 passengers riding the small bus since its inception on the route in March 2018. Passenger getting on the Trapizio Autonomous Bus. I also visited the local transit operations facility from where the autonomous shuttle (nicknamed “Trapizio”) operates. Marcel Seelhofer, the COO of the Public Transit Authority of Schaffhausen, called Verkehrsbetriebe Schaffhausen (VBSH), showed me how the vehicle operates on Route 12 of the local service in their operations control system/dispatch software along with live footage from cameras inside the vehicle. The Trapizio vehicle shares some of its stops with the trolley buses, which always have priority. The operations control system coordinates the timing. Neuhausen proves that autonomous vehicles (AVs) can be integrated into regular service. Whether this is as a first- and last-mile supplement or to service a low-density area, AVs are about ready for prime time on real routes with regular passengers. I met with Peter Schneck in Neuhausen, the founder of the technology company AMoTech, which led the efforts to bring this new service to life locally. Schneck assisted bringing the state government of Schaffhausen, which provided capital funding and license authority to operate on public roads, the local transit authority to operate the autonomous vehicle, and technology providers, including the bus manufacturer Navya, the CAD/AVL software, and other technology required through Trapeze Group, together to make the introduction of Trapezio successful. He also co-founded the Swiss Transit Lab under which these three groups work closely with other technology providers, academic institutions, and the public to study this and other mobility innovations. So the right way to introduce and integrate AVs into regular service is to have all three legs of the stool in place with sturdy support from the local government, the transit service provider, and close partnerships with technology vendors including software and vehicles. There must be all three entities working together in harmony for you to successfully start AVs running in regular route service on open roads in mixed traffic. What Does the Future Look Like for Autonomous Shuttles? The service is going so well in Neuhausen, that plans are underway for expansion. The new route will be for tourists to ride around the popular Rhine Falls (Europe’s largest water fall) in Neuhausen with a new, four-wheel drive Navya autonomous shuttle bus on order that can traverse a 15% road incline fully loaded with passengers. AMoTech Sr. Project Manager Alexander Schulze and Marketing Specialist Yannick Buzberger showed me the new proposed route which will take it through locations with crowds of people. Another test for this newly burgeoning technology with great promise. 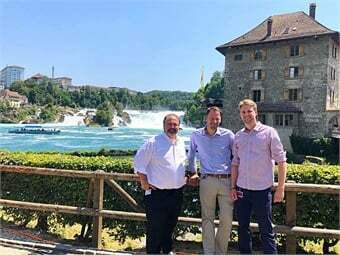 Paul Comfort (left) standing with Alexander Schulze (middle), AMoTech Project Manager, and Yannick Buzberger (right), Trapeze Marketing Specialist at the Rhine Falls where the second Trapizio AV will soon be transporting passengers. Switzerland showed me what can be accomplished with strong public support for public transportation and mobility innovations. Their precision approach to providing public transit allows for heavy utilization, high productivity, and on-time performance controlled largely with advanced technology in big cities like Zurich. While in smaller cities new mobility advancements, such as using autonomous buses in regular route service, are leading the world and designing approaches that can be modeled by the rest of us. Paul Comfort is VP, business development with Trapeze Group. Stay tuned at www.metro-magazine.com, as Comfort interviews North American transit CEOs about their impressions on autonomous vehicles and more.